There are some foods that only had one chance in your life to try; Ben & Jerry’s Peanut Butter and Jelly Ice Cream, Crystal Pepsi, Burger King’s Spicy Chicken Sandwich (the original bright orange patty one), Holiday Spice Pepsi. Others are a once a year event, like The McRib or Shamrock Shake. Holidays bring out a lot of annual specific flavors; pumpkin flavored everything for Halloween, peppermint flavored everything for Christmas, but what flavor would you give the Mexican holiday Dia de Muertos, or The Day of the Dead? Well, if you go to Mezcal Tequila Cantina that flavor is Spicy. As I’ve mentioned before, and Agent Dale Cooper would agree, Mezcal make a damn fine plate of nachos. 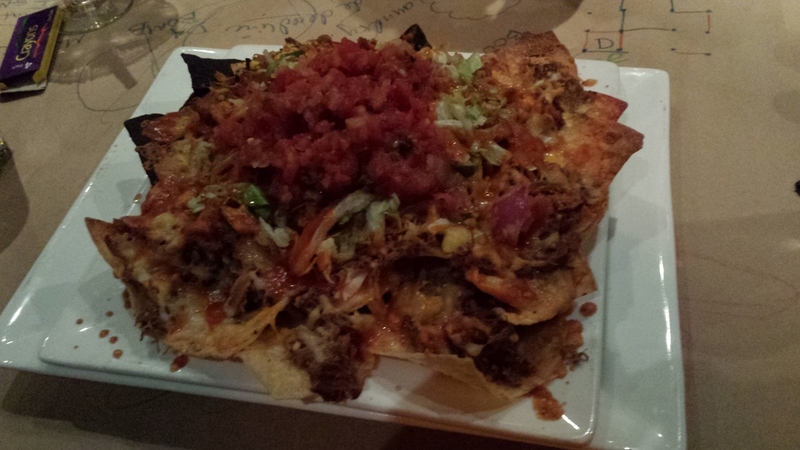 Nachos are one thing though, and spicy nachos are quite another. You’ve got to combine the normal flavor of the nachos with the perfect blend of spiciness so as to not be too overpowering, but still let you know you’re eating something hot without masking the base taste. Does Mezcal pull it off? Yes. Are these much different than their regular nachos? No, not really, but that’s not a bad thing. You take their base, add a little spicy pulled pork, habanero cheese however, and spicy sauce and you’ve got a dish with a little kick. The spicy isn’t in your face, but it does sneak up on you. Would I go so far as to say that these are even better than their regular nachos? Yes, I totally would. Here however is the rub. Yes, these are delicious, but you can only get them for five days this year, and this being the final day of their Days of the Dead event, if you haven’t had them already or not hitting them up today, you’re going to be out of luck. What’s an even more terrifying possiblity is that this could be the only time these will ever be sold, going from The McRib annual release to the Holiday Spice Pepsi once in a lifetime occurrence. You’ll have to run down there tonight and grab yourself an order just in case. Worst case scenario, you have a meal so delicious that the rest of your life is haunted by the spectre of these nachos that you’ll never again be able to order and you become an empty husk without them. Best case scenario, you have a year of slowly building anticipation until you are able to try them again. The choice is yours, but I’d recommend choosing Spicy Nachos.